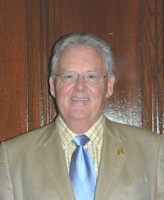 On Sunday, July 25, Texas Thoroughbred Horsemen's Benevolent and Protective Association (TTHBPA) Director John O. Roark was re-elected for a third term as president of the National Horsemen’s Benevolent and Protective Association (NHBPA) by that organization’s board of directors. The election was part of the NHBPA’s summer convention held at the Westin Harbour Castle in Toronto, Ontario, Canada, which was hosted by the HBPA of Ontario. The Texas Horsemen’s Partnership (THP) is an affiliate member organization of the NHBPA, a national horsemen's organization consisting of 31 affiliate member organizations and representing over 36,000 horsemen throughout North America. Roark, who has served two two-year terms, was elected to a three-year term as president and chairman. There were no other nominees. Previously, the president's post was unpaid, but under the new structure, he will be paid an honorarium of $36,000 a year. Roark explained that he wanted to continue at the helm of the National HBPA to take care of what he called "unfinished business." He mentioned two items: establishing an international wagering hub to increase revenue for horsemen, and working with other industry groups to establish the national Office of Wagering Security. "An international racing hub is vital to the industry," Roark told the membership. "If we can get that up and operating it could double purses, and you won't have to deal with racinos that could end up owning you if you're not too careful." As for the national security office, Roark said the National Thoroughbred Racing Association (NTRA), of which he is a board member, could very well establish it by September. Roark indicated the NTRA wants broad support for the office but could move ahead in the absence of industry consensus given the important nature of the project. The pari-mutuel industry is currently under attack in Washington, D.C., given its reliance on Internet wagering, account wagering, and interstate simulcasts. Officials have said the industry must prove to legislators it has its house in order when it comes to security and integrity of wagers. "How many of you want the federal government running your business?" Roark said. Roark, an attorney and native of Bug Tussle, Texas, currently resides in Temple, Texas. Pennsylvania HBPA Director Joe Santanna was unanimously elected as the NHBPA's secretary-treasurer. He had previously served in that position by appointment, but as part of an organizational restructuring that was passed by the NHBPA Board at the convention, the secretary-treasurer became an elected position. The president position was also changed to become a president-chairman of the board position. Under the new organizational structure, if for any reason the president-chairman of the board cannot serve out his term, the secretary-treasurer would automatically ascend to that post. Dr. Ed Hagen of Oregon, who had held the position of NHBPA’s chairman of the board since 1991, was elected as the organization's chairman emeritis. In that capacity, he will continue to represent the NHBPA at some industry functions and meetings. The National HBPA board of directors also approved creation of four regional vice president posts. After a brief caucus, Tom Metzen of Minnesota was elected to head the Central region, Robin Richards of Virginia the Eastern region, Bill Walmsley of Arkansas the Southern region, and Dave Benson of Oregon the Western region (on a temporary basis). The THP is a member of the NHBPA's Southern region, along with the Alabama, Arkansas, Florida, Louisiana, Oklahoma, and Tampa Bay HBPAs. Southern Region Vice President Walmsley is a previous president of both NHBPA and the Arkansas HBPA. The position of executive director, currently filled by Remi Bellocq, has been changed to chief executive officer. Bellocq's title and responsibilities will change under the restructuring.